In this insightful article, an analyst shares the reasons why an integrated drag-and-drop graphic user interface (GUI) dramatically improves network programming efficiency, network troubleshooting speed, and network monitoring accuracy over command line interface (CLI) or Flowmap approaches. 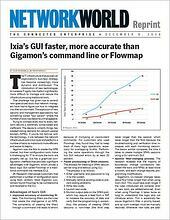 According to a series of customer interviews by ZK Research, “Gigamon…configuration tools make it challenging for IT to ensure the tools are properly set up.” Ixia’s graphical configuration interface provides significant advantages over Gigamon. Read this article to get the insights you need to optimise your network performance.